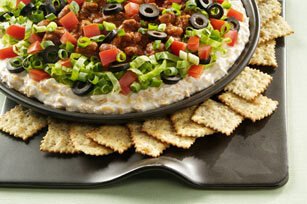 Black olives, tomatoes and green onions make this creamy Chili-Cheddar Beer Dip as festive-looking as it is crowd-pleasing! Please use alcohol responsibly, Michelob ULTRA® is a registered trademark of Anheuser-Busch. Beat Neufchatel and beer with mixer until well blended. Stir in cheddar; spread onto large serving plate. Place lettuce around edge of Neufchatel mixture; fill center with chili. Sprinkle with onions, olives and tomatoes. Substitute milk for the beer.